The aim of this tutorial is to learn how to implement CUG in AEM. 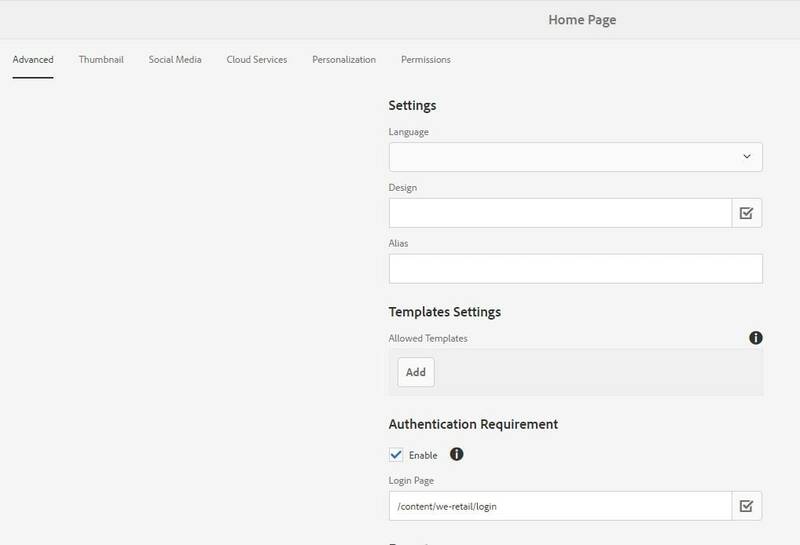 Some time we come across the requirement for restricting set of pages behind the login or only for registered users on publish instance, to cater this requirement AEM provides closed user group CUG. Using CUG you can restrict specific pages or child pages of parent page on publish instance. Once you implement CUG on any page you would need to login first to access it, if you are a registered user and part of cug then you can see respective landing page else for anonymous or non cug user you would be redirected back to login page.In this tutorial I am going to use Touch UI console as from aem 6.3 Adobe has announced that they are going to deprecate classic ui going forward. Create Closed User Group (CUG). Configure Closed User Group ( CUG ) on Dispatcher (optional if you are not using dispatcher). Test Closed User Group(CUG) on publish instance. Click on Groups and create a new group for CUG users like cug_access. Assign users to this group, whom you want to provide restricted access. Activate any users that you have assigned to your CUG. (For first time, all members of cug_access). You have successfully created closed user group. now let’s see how to Configure CUG on specific pages. I have used we retail site for this tutorial. Create pages as per below site structure. Login page is created using login component that we have created in previous tutorial. 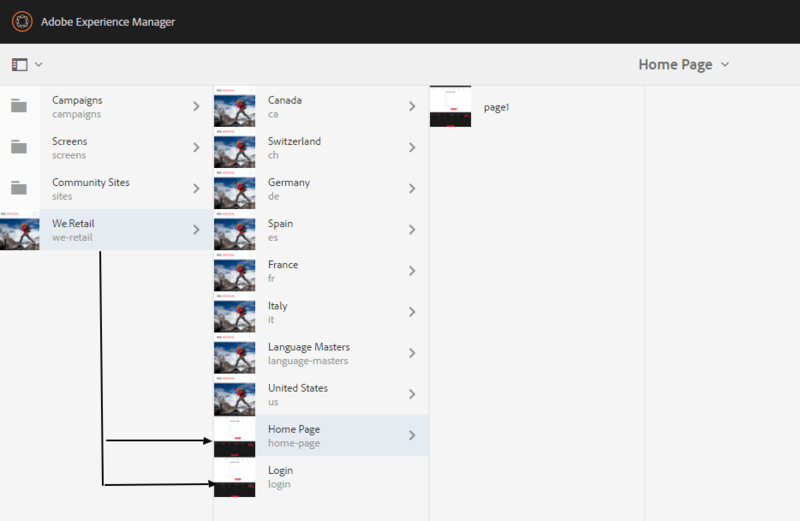 For using 6.2 login component in aem 6.3 change the proxy setting of content page template and add our custom login component to allowed component. Select the root page and open the Page Properties. Note:- Select checkbox to define that this page (and any child pages) belong to a CUG. This is a mandatory field to enable CUG, if this is not checked all other field will not have any effect. If you are using oob login component enter (/content/we-retail/us/en/community/signin.html) as login path. Note:- Login Page where you want anonymous user to redirect to after they access page. Login Page should have logic to authenticate user. If this is not specified then standard login page is used. Standard login page is configured under felix console with configuration called “Adobe Granite Login Selector Authentication Handler”. This is optional, if you want to use standard login handler. 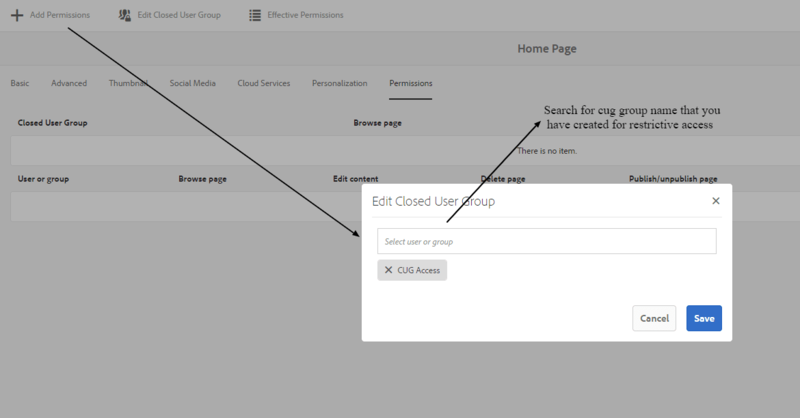 Click on Edit Closed User Group and enter cug group name (For Example- CUG Access) and click on Add. 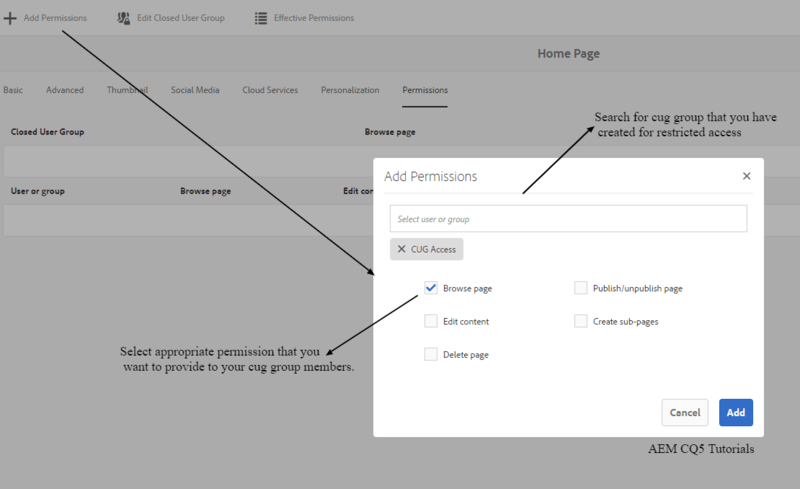 You can also assign extra permission to specific user or your cug group by clicking on add permissions (For Example- CUG Access) and click on Add. Click on Save & Close button from Top Right corner to save the changes. That’s it you have successfully configured closed user group (CUG) on the page. If you are using dispatcher between your author and publish instance the n you need to configure below settings also. \virtualhosts: Entire the path of the pages on which you want to apply CUG. Note:- Remember to create two farm for same site. One is for secure (logged in state) and another for normal state in separate farm files. If you want to cache both type of pages. \cache: A cache directory that is dedicated to the files that the CUG applies to. Set allowAuthorized to 0 under cache section as shown above. Click here For more details about Dispatcher configuration in aem. Congratulations your dispatcher is set now to handle CUG pages. Activate/Publish All pages and sub-pages that you have created from http://localhost:4502/sites.html/content. Go to Group Admin (http://localhost:4502/libs/granite/security/content/groupadmin.html) and activate your group. For Example:- cug-access in our case. If you don’t find option to activate users form touch ui, go to user admin in classic ui (http://localhost:4502/useradmin.html) and activate all the users that you have created. Make sure your replication agents are properly configured. Note:- If it is not working as expected check for permission on publish instance of user that has been replicated/activated. 7 Responses to "Implement CUG in AEM"
All these days, I have been seeing only theories on CUG, but for the first time it is a practical session on this subject. 1. Testing: Generally when we open publish URL, it does not ask for a login, unlike an Author that insists on Login. 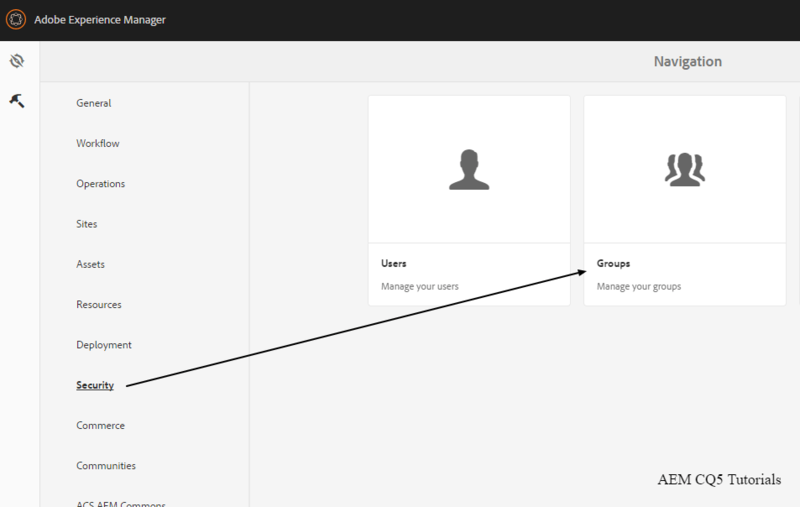 On Publish, we have the option to continue to use as an aonymous user or login and use. Is this how you want us to test CUG? By anonymous user and logged in user? 2. The Dispatcher changes you suggested are on top of plain vanilla Dispatcher installation? 3. Is it possible for you to create a package, that we could install and test easily? For Dispatcher settings, it may not be possible to create a package. 1) Yes its true, you can restrict specific/pages and sub pages under it using CUG, When anonymous or unauthorized user tries to access it. It will redirect them to login pages. But for public pages it wont ask for login. I understand “configuring dispatcher does not require any coding”. For the changes on AEM side, could you pl create a package, that I could deploy quickly? [Sat Aug 05 18:47:47 2017] [D] [pid 14084 (tid 1156)] Session manager: no authorization information found. Very nice article to explain the functionality and usage of the Closed user Group. I just need a small clarification, as per my requirement, my users do not exist in AEM. I am using third party REST services to validate the authenticity of login. Would it be possible to restrict the anonymous users (the users who are not logged into the website) to see the protected pages content by using the Closed User Groups? If yes, would it need any extra configurations/code? I dont see the buttons Add Permission , Edit CUG on the permissions tab of page properties. We are still using Classic UI in aem 6.3. How can we edit cug on classic ui pages in AEM 6.3?